On Jun. 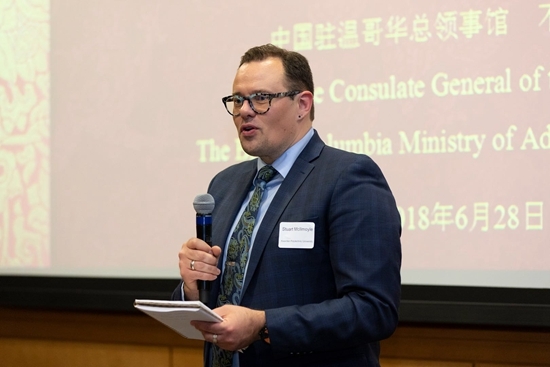 28,Consul General TONG Xiaoling attended the 2018 Chinese Government Scholarship Granting Ceremony and Summer Reception held by the Studies in China Alumni Society of British Columbia(SCAS-BC).Mr.Jamie Edwardson,acting executive director from the British Columbia Ministry of Advanced Education,Skills and Training,Dr.Randall Martin,executive director of the British Columbia Council for International Education,2018 Chinese Government Scholarship recipients,alumni,guests of honor were present. 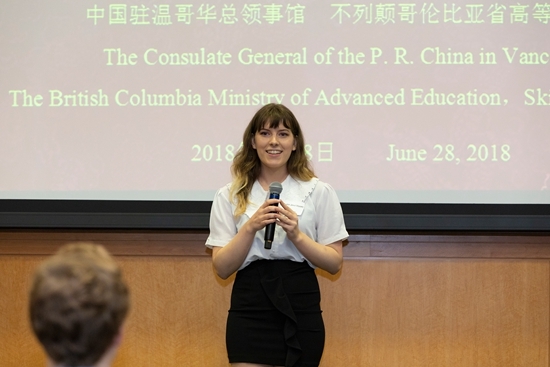 Consul General TONG Xiaoling gave her sincere congratulations to all the 2018 Chinese Government Scholarship recipients and presented earnest greetings to all the alumni expressing deep appreciation to the contribution of the member of SCAS-BC have done towards people-to-people exchange,educational and bilateral economic and trade cooperation between China and the British Columbia.She then gave a brief introduction on the reform and opening up in Chinese education sector for the past 40 years,which outlined the important role the Chinese Government Scholarship had played in building friendship between China and Canada.She added at the end of the remarks that the door to China's opening up would not be closed, it would only grow wider and wider. Mr.Jamie Edwardson read the message from Honourable Melanie Mark,the Minister of Advanced Education,Skills and Training, encouraging the scholarship recipients to cherish this opportunity and broaden their global vision.Dr.Randall Martin added in his remarks that China has become the world's largest students outbound country and the third largest destination country for international students. Consul General TONG Xiaoling and Mr.Jamie Edwardson presented the certification of sponsoring to the 10 Chinese Government Scholarship recipients. Mr.Stuart Mcilmoyle,chief executive officer of the Maple Leaf Educational North America,announced SCAS-BC was about to officially registered to the British Columbia government,which meant the formal establishment of the board as well as the organizing committee. 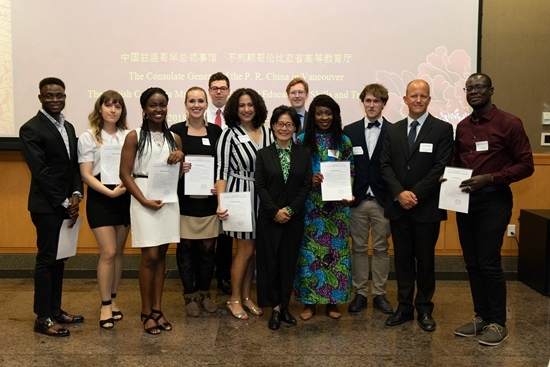 At the end of the event,the representatives of the 2018 Chinese Government Scholarship recipients have shared their feelings and stories with China expecting that they could be the bridge between China and Canada and contributed more to the friendship of the two countries.And the alumni expressed the immense gratitude for having got the chance to study in China,which has benefited them a lot and made important and positive impact on their future life and career development.